I am very pleased to present the following article by Randall Breland as a guest writer on Entrusted With The Gospel. “I’m going to go tend my vineyard,” said my wife after we shared a brief afternoon respite. She did not mean her butterfly garden or summer squash. She meant our home – yes, dishes, laundry baskets, and who knows what other glorious and legitimate tasks through which she serves God and our family. As I continued to lie there, a strong sense of guilt washed over me. She does not answer to God for whether or not we have had dominion in our home, I do. Was I just a lazy manager who supervised through lazy words of inaction? The task I had set for myself that afternoon was not home focused. It was self-focused. Further, it was a task that required little physical exertion. I was going to study Hebrew flash cards … for hours. I am an Old Testament Ph.D. candidate, which brings with it some necessary, albeit elementary, tasks. Flipping flash cards can be boring, rote, and mundane. And, when compared to being “productive” – like earning a strong, stable income or washing dishes – Hebrew flash cards appear silly and foolish. I was labeling myself a sluggard for investing in my mind. The heart of the matter is this: I am tempted to see investment in my mind as unproductive. American culture has taught me that the whole of productiveness and utility is manipulation of the material world paired with the wielding of power and pleasure through assets. As Poor Richard says, “drive thy business, let not that drive thee; and early to bed, and early to rise, makes a man healthy, wealthy and wise.” While Poor Richard is correct, his proverb does not speak to the whole of productiveness and utility. The American conception is deficient. Productivity is more than the attainment of assets, security, and good ole’ American industry. We Americans have been duped into thinking that a stable vocation and a polished white fence are the goal of life. When these are present, they are good gifts from God for us to enjoy with a pure conscience. As Tom Sawyer learned, though, they only cost an apple-core and some pocket trinkets. This shortsighted view of productivity and this spirit of anti-intellectualism have infected the church. Future pastors are told that the classical study of languages, theology, ethics and philosophy are a waste of their time. These “old methods” are replaced with pragmatism and “proven” models of ministry-industry. The church as a whole, and especially those called to serve her in the ministry, needs to reconsider this shortsighted view of productivity. Character cannot be bought or quickly attained, and a mind cannot just be whitewashed every now and then. Paul says that it is “by the renewing of our mind” that we put on the new self (Ephesians 4:23-24). Now, this verse certainly has the regenerative work of the Spirit in mind. But, are we not called to join the Spirit day-by-day in this work of regeneration? Such work takes time and energy and emotion - years of it - to build a mind and character that is a vessel “prepared for every good work” (2 Timothy 2:21). So, here I sit on my balcony, hurriedly writing this essay so that I can get to the more important thing. I have a vineyard that needs to be tended. My vineyard is currently Hebrew flash cards, Hebrew poetry, and a book by an old literary professor named C.S. Lewis. While I have no guarantee of a vocation in church leadership, I am working hard now so that I may be faithful in whatever vocation and able to dispense old and rich wine. So, I study God’s Word, I flip Hebrew flash cards, and a read great Christian thinkers like C.S. Lewis. And, at times, I let the kitchen sink get dirty enough to warrant an HGTV makeover. I am thankful for a loving and serving wife who believes every word of what I have just written. She goes and washes dishes because she believes those entering the pastorate, beyond all people, must be well educated. Our culture tells you that you get an education – ahem, erect a vineyard – faster than ever! That may be true, but ask yourself: will the wine be worth drinking? 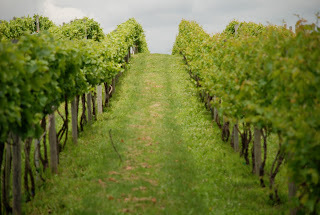 My sincere hope is that I am doing more than tending a vineyard. I hope that I am building a vineyard that will be equipped to love people, edify the church, and build the kingdom of Christ. And honestly, all I will do is dispense some very old wine to them. Sure, I hope to “produce” knowledge. But, more than that, I hope to dispense the wisdom and strength of the pages of biblical and church history. Is not my entire faith built on a 2000-year-old document? So, I study what is old and lasting, not what is new and fading. And when I am tempted by our culture’s vision of productiveness, I reject it and keep on flipping Hebrew flash cards. This call for intellectual pursuit is for all people, not just future pastors. Culture is not built on its industry, but on the mind of its citizens. It is not saved by material production and anti-intellectualism. It is lost through these things. Culture is not the amounting of wealth and the painting of white picket fences. Those are cheap. I am often encouraged by the example of our Lord Jesus, who did not begin his ministry until he was 30 years of age. I will be thirty in a few months, and will not be prepared for my vocation – shepherding the church. So, when you are tempted to read and study instead of mow the lawn, perhaps you are being correctly tempted? Don’t be duped by the anti-intellectualism and pragmatism that is the spirit of our age. Invest in your mind while you can, so as to ensure that you yourself are more than a whitewashed fence. What does the Proverb say? “A little sleep, a little slumber, a little folding of the hands to rest, and poverty will come upon you like a fool.” To quote Benjamin Franklin: “We are taxed twice as much by our idleness, three times as much by our pride, and four times as much by our folly.” Well, I have a vineyard to build … Hebrew flash cards. Shalom. I am thankful to Owen Strachan and Denny Burk for provoking my thoughts, respectively, on anti-intellectualism and on the call to tend our vineyards.